Home » Blog » Celebrating Catholic Schools Week 2019! Celebrating Catholic Schools Week 2019! 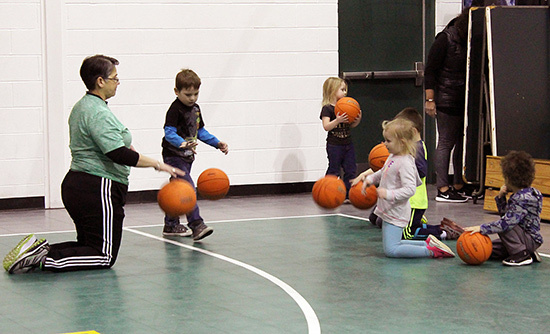 Sister Joni Luna (left) works with students at St. Patrick’s School on the art of dribbling. Beginning on Sunday, Jan. 27, the Catholic School Community has celebrated Catholic Schools Week, an annual event in honor of Catholic education in the United States. The week is sponsored by the National Catholic Education Association. Catholic Schools Week will conclude on Saturday, Feb. 2. Saturday, Feb. 2 – Celebrating Families. The Sisters of Providence have had a rich history in the ministry of education, dating back to their foundation in 1840 with the establishment of The Academy, now Saint Mary-of-the-Woods College. Throughout these last 179 years, many sisters have ministered in various schools at many levels, enriching young students along the way. As of 2019, there are 12 Sisters of Providence still enriching the minds of young students in the world of education, including Sisters Anji Fan, Joni Luna, Emily TeKolste, Maureen Fallon, Marilyn Baker, Judith Birgen, Anne Therese Falkenstein, Mary Catherine Guiler, Marie Paul Haas, Anna Ho, Mary Ann Stewart, Therese Whitsett and Norene Wu. Sisters Barbara Bluntzer, Mary Morley and Patricia Geis are also involved in tutoring. Sister Joni Luna (from left), Sister Jenny Howard and a seminarian from Bishop Simon Brute College Seminary, Daniel, prepare to speak to students at Providence Cristo Rey High School. Photo courtesy of Providence Cristo Rey High School. Recently, Sister Anji, Sister Emily and Sister Joni shared what their schools were taking part in regarding Catholic Schools Week. And despite the frigid weather many faced in the Midwest, some of the activities at these schools did take place. Sister Joni ministers at St. Patrick’s School in Terre Haute. She serves in the physical education department. During the past week, the school participated in many activities, including conducting an open house; handing out surprises to students and taking a vacation from homework; having an all-school Mass; having a family picnic; and taking part in the school’s annual science fair. Sister Joni said the week is very important for the Church and its parishioners. Sister Joni added that she and Sister Jenny Howard visited Providence Cristo Rey in Indianapolis on Thursday to conduct a vocations talk with sophomores, juniors and seniors as part of the week. Sister Anji ministers at the Oldenburg Academy of the Immaculate Conception located in Oldenburg, Indiana. She teaches in the math department. During the week, Oldenburg Academy conducted several activities, including a trivia contest regarding the school; having students write thank-you notes to teachers and parents; taking part in a collection of toothbrushes and toothpaste for the people of Haiti; and free hot chocolate and donuts for students. Sister Emily currently ministers as a high school teacher of theology and sociology at Bishop McNamara Catholic School in Kankakee, Illinois. She said due to severe weather conditions, Bishop McNamara had planned to recognize the themes, but cancellations were called. However, she said the school’s Mass in celebration of National Catholic Schools Week took place on Friday. Sister Maureen also ministers at Bishop McNamara as the assistant principal for curriculum and instruction. Jason Moon serves as media relations manager for the Sisters of Providence. Previously, he spent more than 16 years in the newspaper industry. A question: are there only four Sisters of Providence ministering in formal education in 2019?